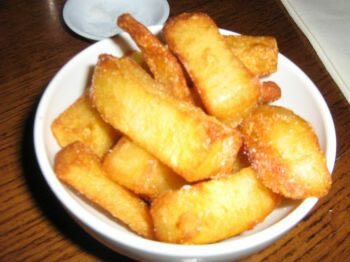 Below is the recipe for triple-cooked chips. These are the best chips you will ever taste. Place them under running water for 10mins to get the starch out of them (or soak them for an hour). Then put them in to boiling water for 6 minutes. Then lay them on a tray and put in the fridge (that draws moisture out of them). When they are cold – ‘poach them’ – into the duck fat fryer at 140deg for ~6mins, or until just getting soft. Note temp – 140deg. Then put them back on the tray and back in fridge until they are needed. Then when you need them they go in to duck fat fryer at 190deg until brown & ready. Then stack them on the plate like the jenga game and enjoy. Add salt to your taste prior to stacking.